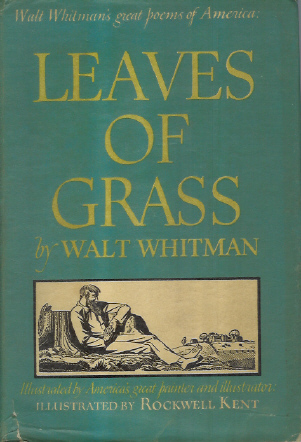 Kalahari Books - Leaves of Grass. Home Kalahari Bookstore Poetry Leaves of Grass. Reprint illustrated by Rockwell Kent. Grey cloth covered boards, with green embossed title and grass pinture. Edges bumped, spill on back cover. Owners stamp on end papers, othewise interior of the book is in good condition. Dust jacket has some creasing and a spine tear.